Janette Sadik-Khan’s new book Streetfight comes out next Tuesday March 8. Sadik-Khan will be in L.A. speaking and signing books on March 16 at the Hammer Museum and March 17 at Gensler in downtown Los Angeles. Congratulations to Erik Griswold who won Streetfight during SBLA’s pledge drive last week, and to Luke Klipp who won Gabe Klein’s Start-Up City. “If you can remake it here, you can remake it anywhere.” So concludes former New York City Transportation Commissioner Janette Sadik-Khan in Streetfight — Handbook for an Urban Revolution (Viking 2016), co-written with Seth Solomonow. Sadik-Khan should know. As one of the world’s leading placemakers, under former New York Mayor Michael Bloomberg, she helped make New York the go to city for innovations in public space, ground transportation, bike infrastructure and connectivity. 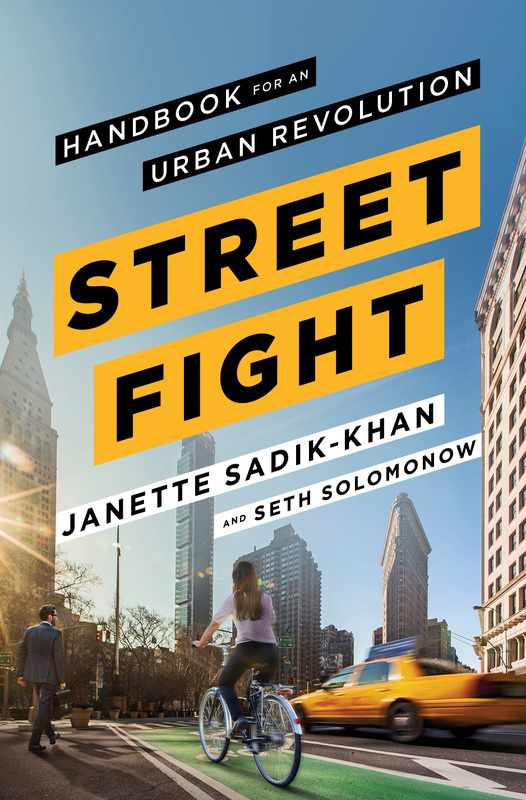 In Streetfight, Sadik-Khan and Solomonow tell the story of how New York was transformed into a city known for its public plazas, bike lanes, bus rapid transit (BRT) lines and new methods of street paving and service delivery. Streetfight is an inspiring read. The sort of book that should be read by every officeholder wondering how they will advance their agenda in the rough and tumble world of contemporary urban politics. But it is also a read for the rest of us. Anyone whose memory is longer than a New York minute who can remember when New York wasn’t the pedestrian and bike friendly envy of cities the world over. The book which chronicles the hard fought battles Sadik-Khan and her allies largely won in bare knuckles New York is also a paean to data, preparation, collaboration and leadership. As Sadik-Khan details throughout, and writes near the end of the book, “In God we trust. Everyone else bring data.” Such was the way things were done in Mayor Bloomberg’s administration and thanks to the care with which things were done, the changes that were implemented on Bloomberg’s watch are more likely to be permanent than they otherwise might have been. In Streetfight, the authors generously acknowledges that Sadik-Khan didn’t do it alone, crediting everyone from Jane Jacobs to Robert Moses, Mayor Bloomberg, transportation planners like Sam Schwartz and New York’s active transportation advocates at Transportation Alternatives, Streetsblog and Streetfilms. Cities like Bogotá and Medellín as well as Copenhagen, Amsterdam and Paris get their due while even Los Angeles gets a nod as a place that is slowly getting remade. The beauty of smart planning is how free one is to borrow from the best practices one observes around the world. And no one is a better observer and borrower than Sadik-Khan. In her new role at Bloomberg Associates she continues the important work of remaking cities advising lucky mayors the world over on how it is done. The beauty of Sadik-Khan’s rare gift for placemaking is in her clear, generative vision. Even when paying credit to others, Sadik-Khan improves upon her predecessors’ work. Jacobs described the New York street scene as a “ballet.” As someone who has lived and worked in New York most of my life, and having watched decades of taxis, buses, pedestrians, trucks, bike riders, and double parkers duking it out, I’d describe city street life as more of a contact sport like rugby than ballet. Times Square circa 1989 was still in its raunchy era, with Ratso Rizzo hustlers hanging along sidewalks in front of tchotchke stores and adult theatres… It was certainly not the cleaned up Giuliani version that would come later, much less the pedestrianized Times Square we have today. Speaking at public hearings, local residents and business owners invoke Jacobs-like language as a smokescreen to fight Jacobs-like projects. They oppose plans for walkable neighborhoods and bike lanes, claiming that they might congest traffic, make streets less safe, and pollute the environment or erode property values. So be it. While they are reading Dorothy Rabinowitz who famously warned that “The bike lobby is an all-powerful enterprise” and that bike share in New York had begrimed the city’s best neighborhoods, we’ll be studying how to remake our cities so the changes stick. You get what you build for. Building more lanes only creates more traffic, as demonstrated repeatedly in southern California on mindless projects like the Sepulveda Pass carpool lane project. The lessons in Streetfight are both modest and transformational. For example, the authors do an excellent job explaining how we can remake our urban streets by borrowing some space from the excessive twelve foot wide lanes given over to cars and trucks that rarely exceed eight and a half feet across. In How to Read a Street, Streetfight‘s authors explain how by narrowing the parking lanes we have more than enough room to add a bike lane and to shorten the distance pedestrians have to walk to cross through traffic. This road diet or traffic calming also makes the street safer as people tend to drive faster when the lanes are wider. Think about a footpath worn into a park lawn where pedestrians cut a corner to get from one sidewalk to another. In New York, the recognition of a strong desire line prompted Sadik-Khan and the DOT to create 6 ½ Avenue, a Harry Potter inspired midblock crossing between Sixth and Seventh Avenues. Streetfight is filled with instructive illustrations and before and after photos of public plazas and streets reworked to better serve residents. A photo of a public plaza in Rome filled with parked cars finds its happy counterpoint in before and after shots of Brooklyn’s Pearl Street Plaza in DUMBO. “If you can remake it here, you can remake it anywhere.” Words to live by. NYC… 1) Bloomberg should be drowned in a large vat of sugary soda. 2) “those of us smarting from the endless battles over obvious improvements” If the improvements are so obvious, why the endless battles? Obviously, they are… not. Even if you don’t drive, road infrastructure is a economic requirement, and the movement to deconstruct is such a narrow perspective. Read the book. NYC spent peanuts on bike infrastructure compared with what it spent on Sadik-Khan’s watch on road repaving, bridge reconstruction, etc. A lot of roads and bridges were crumbling before Bloomberg came into office and significant infrastructure investment was made during his terms. As for the “endless battles” – many of them were with grumpy New Yorkers who hate anything new – like Dorothy Rabinowitz at the Wall Street Journal who doesn’t accept that the world is round. Not a whole lot you can say to someone who thinks like that. This Week Only! SBLA Winter Fund Drive, Win Sadik-Khan, Gabe Klein Books!